(This page must be viewed at FULL-screen 1024X768 resolution or higher). 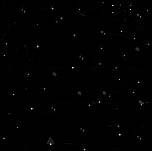 Welcome to one of The Twilight Zone Archives most unique sections yet! 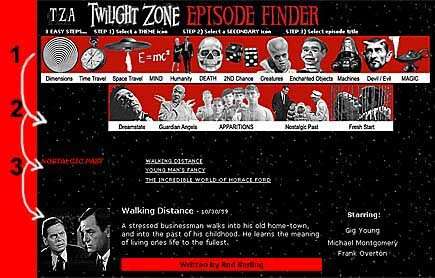 For your perusal, the TWILIGHT ZONE EPISODE FINDER (original series only). The TZ Episode Finder is a helpful/fun tool for solving "What's that episode...?" In STEP 1, select an icon for the most GENERAL THEME of the episode you're thinking of - this loads a second series of icons from which to choose. In STEP 2, fine-tune your search by selecting an icon for the SECONDARY THEME for the episode - this will then open a list specific to that episode type. In STEP 3, choose from a list of narrowed-down episode titles - choosing an episode title will load that particular episodes info below.